Thoughts for the astrology of the New Moon in Capricorn. We currently have SIX planets in Capricorn. That is quite a rarity. This new moon kick starts eclipse season with the next Full Moon in Leo being a lunar eclipse. With Saturn’s recent move to Capricorn we are faced with things slowing. The astrology messages I’ve read correspond to what I’m feeling at the moment. One step at a time. Slowly slowly wins the race. All will come in time. I’ve been chastising myself for missing a networking evening last night. I’ve never been to anything like it before and I was nervous. I kept working to get everything ready, website, some flyers, but when it came to it, I couldn’t go. The fear set in and as anyone can imagine, getting out after dark in January at tea time became a big deal. It isn’t, but to me it’s alien. Anyway, I realised that maybe I’m trying to go to fast. The need to have my website ready before I share it with others meant that I cracked everything that needed doing over the past 4 days. Jobs that had been on hold since November got done. Having the networking event as an imaginary deadline helped and I’m now ready to start sharing it and adding new things as I go. There is another event next month that I’m planning on going to, I’ll get there, there’s no rush. The current energies are questioning our authenticity and integrity. Making us look at the picture long term. I could see where I need to put my attention. Right now, it’s on me and getting through the rest of the winter. We’re at that stage where we just want summer to hurry up and get here, we want things to move fast and we’re tested when we realise there’s another couple of months before we really see the light returning. Giving myself oxygen first. That’s where I need to be. Making sure I walk my talk and take my own medicine. The business will grow. I will get out there and share what I do, people will find me. Capricorn sees where he needs to be and begins by taking a step. He knows that with one step after another, he’ll get there eventually. Capricorn is adept at climbing mountains and sheer cliff faces so has plenty of experience at navigating difficult routes to the top. Slow and steady. Be true to yourself. If you’re currently resting on a ledge, that’s fine, you’re recharging for the next part of the journey. If you lose your footing it can be scary, but persevere we must. Keep going. Small steps till we reach the top. With authenticity in mind, and walking my talk of promoting and advocating self care, I took some time this afternoon to pause. I walked in the sunshine and got blown by the wind. I ate. I soaked in a bath of rose scented bubbles, made a mug of cacao and had a fire. Re-connecting with my medicine and what sustains me. Remembering what it is I do and why. Rain is due again this eve, so having an afternoon fire in the January sunshine was the best option. 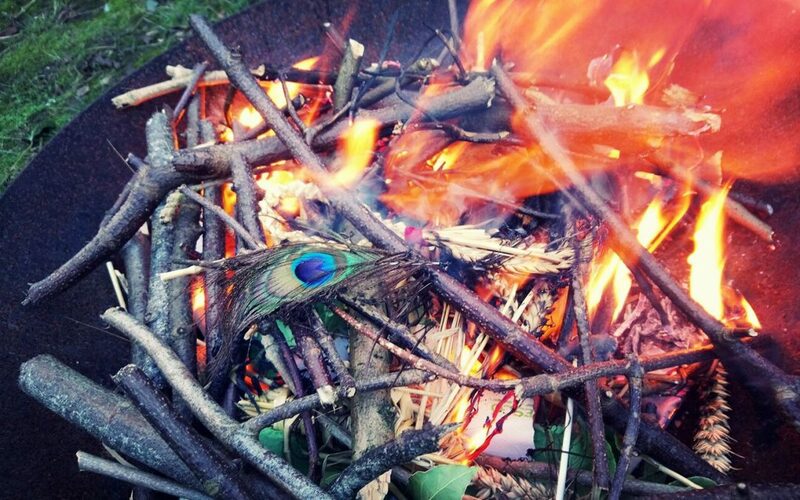 Offerings made to the fire were Bay, Wheat, two dried Ivy crowns and two peacock feathers. All had been on my altar before it got moved and freshened up. Burning the old to make way for the new on the first New Moon of the year. Hi Cat, what a lovely website. I love what you have written about the 6 planets in Capricorn, it really resonated with me as I feel as though I am on the edge of something new but feel very hesitant in making that big step. I am really looking forward to meeting you on Thursday morning and if you think I will be a suitable case study then I would be more than happy to help out.